An appreciation of bluesman Henry Townsend who died Sunday, September 24, 2006 at age 96. I decided to put an episode together with these songs that mention ethnic groups and nationalities after my ears repeatedly perking up when I heard lyrics about "what the Chinaman told the Jew" in these and some later blues songs. The Willie Blackwell song comes from a different place that includes a strange mix of patriotism, violence, and proud fatherhood. It has disturbing lyrics about a man preparing bringing home a Japanese skull during World War II for a newborn son. There's a good discussion of the song from Jim O'Neal at his Bluesoterica site. Though its the only one that features that kind of viciousness towards different people, I thought it was thought provoking regarding how others are thought of at different times. Last show I looked at songs about bonuses promised to WWI veterans. I thought this time I’d look at some songs about the war itself. Because blues weren’t recorded (and its not even entirely clear what form the blues existed in) during the years that the US took part in the Great War, there aren’t that many songs about it. But several blues artists did look back to recall the war, the army, and the effects on their lives at home and abroad. Met old Kaiser and his men and they were playing "Nearer my God to Thee"
Nearly 400,000 African-American soldiers served in the First World War almost all of them drafted. Nearly 40,000 of those were combat troops that served in France. Most served as laborers at army bases at home and abroad. 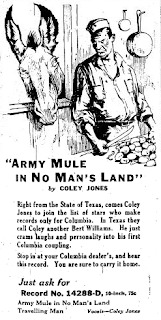 Captain told him "right there you must ride"
When I get out in no man's land, I can't be bothered with nobody's mule (not even my pappy's)"
Mules were commonly used in addition to horses by world war one troops.